I’m actually not at all surprised that the Lab has looked no further than addressing the issue of their selling, reselling or sub-licensing user content. Prior to the update being published, I spent a fair amount of time reading Ebbe Altberg’s forum comments in relation to the Terms of Service and transcribing his statements on the matter at various meetings. One thing that struck me in doing so, was that throughout all of them, he only ever referred to revised the ToS in terms of addressing this singular issue. Unfortunately, even in dealing with this one issue, the Lab appears to have again managed to introduce ambiguity into matters. In their blog post, they state that the updated Terms now require some nebulous form of “affirmative action” on the part of users in order for the Lab to sell, resell or sublicense their content. But what form is this “affirmative action” supposed to take? It’s fair to say that the revised Section 2.3 of the ToS doesn’t give any indication, other than perhaps via the very generic statement of, “as permitted by you through your interactions with the Service”, which could mean almost anything. Even a check on Section 2.4 of the ToS – which the blog post points to as being the basis for the additional language in Section 2.3 – offers little enlightenment. It merely states that “interaction with the service” might be as simple as using the permissions system with any content you place on any Second Life region accessible to any other user. As such, people could be forgiven for taking the blog statement about “affirmative action” as little more than cold comfort. Beyond this, why the Lab have persisted in ignoring concerns over the removal of all reasonable limitations on the granting of shared rights to them, remains a mystery. It’s not as if they weren’t aware of any issues on this matter, because at the end of 2013 and early 2014 efforts were being made to put such concerns directly and clearly to them. I know this to be a fact, because I was an active participant in one such group engaged in those efforts. Again, no-one is denying that the Lab requires the non-exclusive granting of certain rights in respect of users’ content. That is to be expected and should be understood. Without such rights, Second Life ceases to work. It is simply the extent to which the Lab require the granting of such rights since August 2013. 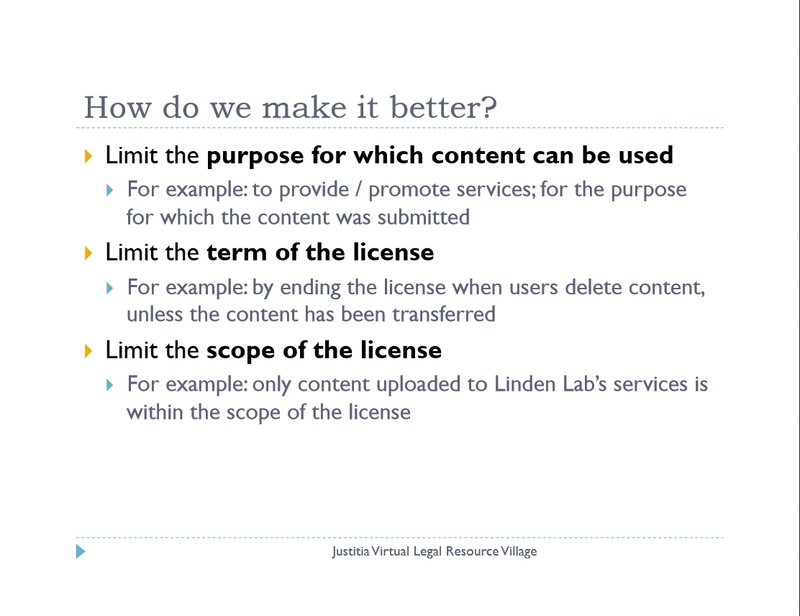 Agenda Faromet, speaking at the October 2013 in-world meeting about the August 2013 Terms of Service changes, was perhaps the first to clearly bullet-point why a reinstatement of reasonable limits on the granting of shared rights to the Lab in respect of users’ content might benefit the Terms of Service. Up until the August 2013 update, the ToS had required rights to user-generated content “solely for the purposes of providing and promoting the Service” (see Section 7.2 of the May 2013 Terms of Service). Even allowing for the fact that since August 2013 the Terms of Service have been applicable to all of the Lab’s products and not just Second Life, it is hard for the untutored eye to understand why this language couldn’t have been carried forward in respect to rights granted to the Lab. After all, “the Service” could apply to Patterns, Desura and any other platform the Lab produces, just as much as it applied to Second Life. And therein lies part of the problem; because the removal of all limitations on rights granted to the Lab appears to be entirely arbitrary, it gives rise to suspicions and mistrust over the company’s motivations. As such, it is a shame the Lab has never really made any effort to clearly express why they believe such a sweeping change assists them in their role as a service provider when compared to the previous, more qualified granting of rights. While it would still be a very poor second to actually working with concerned users to try to amend Section 2.3 to the benefit of all, providing such feedback might at least help in allaying the aforementioned suspicions and mistrust. Unfortunately, I tend to feel that we’re unlikely to see any further movement on this matter; the Lab have revised what they felt needed to be revised, and it’s not as if they were unaware of other concerns related to recent ToS revisions. As such, and like it or not, we still have a Terms of Service which still has every appearance of being creator / collaboration unfriendly.